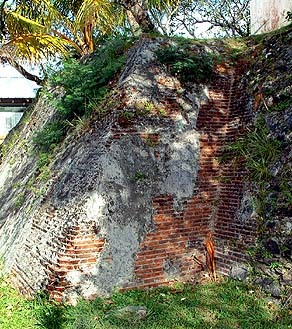 The government buildings in Colonia, Yap, site atop the remains of a Spanish fort. “And then a series of explorers, whalers, adventurers, they visited the islands but they was never any prolonged stay until the Spaniards claimed the islands as their own. "This part of Micronesia was divided between Spanish and Germans at one time, because the Spanish were trying to come out and spread the word of Christianity to the islands, and Germans were going around trying to spread their trading empire. But initially the Spaniards came there. "They influenced the society here on Yap proper. 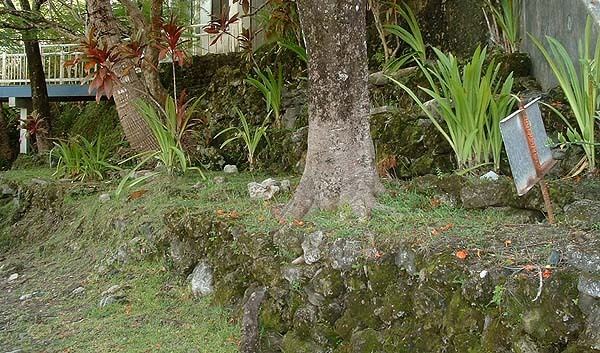 There are still some of the Spaniard’s structures and buildings in Yap. The mission just up the road, some of those buildings were constructing during the Spanish times. They were just recently torn down to be replaced with a newer structure. But up to two years ago there were the old Spanish structures." Around the back, the brickwork of the Spanish fort's foundation can be seen. 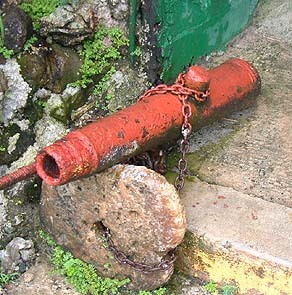 An old Spanish cannon, painted against rust and chained to a small piece of Yapese "stone money" in Colonia. Imeongs Collection. “I should consider these 'stories that I heard'," Mariano begins: "A sailing ship came to Falalop and was anchored by the boat area. The people came ashore and they started a going around, they just scattered around the island. "The men of Falalop, they were in the Men’s House, but they were still asking among themselves, ‘what are these guys doing here?’ In fact they were not really watching the sailors; they were too fascinated by the sailing ship. I guess it was first time for them to see these kind of sails on a sailing ship. And the masts, and the size of the ship. So they were not really paying attention to the sailors." 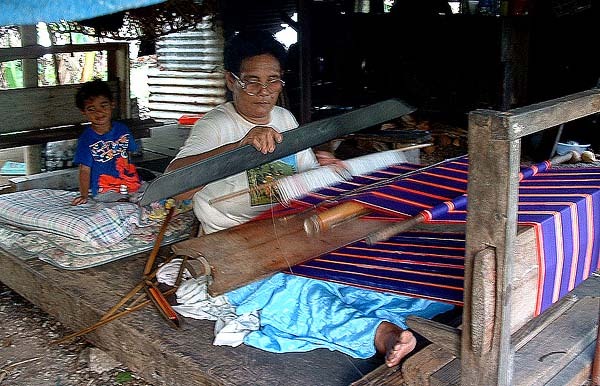 Josephine Y. Hacheg of Falalop using the traditional "backstrap" loom. In her raised hand is the hoapoop wielded by the lady in the story. “It so happened that this one lady was at the loom until this one sailor came and took the unfinished lavalava from the loom. He was folding it and trying to take it, probably as a souvenir. It made this lady get mad, so she took a piece from the loom, a stick that is sharpened on one edge. This stick is usually made out of the iron wood, and this one edge is sharpened. “So she took this part of the loom, hoapoop. It's a stick sharpened on one edge. Brandishing it like a knife, she ran to the Men’s House. She took one very old lavalava—she took one old lavalava because the unfinished one, the sailor was walking away with it. She took this very old lavalava and she went to the Men’s House. She threw the lavalava in the Men’s House, telling the men, ‘if you don’t know what to do to about this ship, then you better wear this, because I’m going to attack this ship’." "That’s when the men started running out of the Men’s House. And a fight broke out. The men here killed all the people that came from the ship to shore. “I heard this story: they say these two natives grabbed this one young sailor, and they fought and they killed him. They didn’t know that shirts are supposed to be buttoned at the front. So they cut the shirt at the back. Each one was trying to claim the shirt. So they ended up, when the shirt was unbuttoned, they ended each having one side of the shirt. “Some of the sailors even swam to the other islands, swam away from the ship. It so happened that this one remaining survivor—I think he was hiding down in the hold or somewhere in the ship–came out at night. This one survivor swam to Mangeyang. " 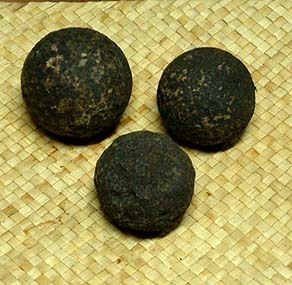 Cannon balls found on Yap, from either the Spanish or subsequent German era. Imeongs Collection. 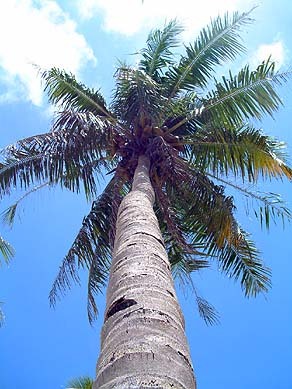 "He was way up on a very tall coconut tree." "By that time there was nobody living on Mangeyang, because they had moved to Fedraey. But still there were houses on Mangeyang, the chief and the people of Mangeyang still visited Mangeyang for food or copra. So this survivor stayed on Mangeyang. "And then one time when the chief came to visit, he saw footprints on the beach. They searched for anybody, they couldn’t find him, and they went back. “This happened for several times. They’d been there seeing footprints on the beach. So the next time the chief came, he brought his dog. It was the dog that found this man. He was way up on a very tall coconut tree. So the chief tried to make friends with him. The chief took him to Fedraey and he became the chief’s son." “It was said that some people on Fedraey, were descendant from that man. And he really worked hard for the chief and the chief considered him his own son, and the chief gave him many rights—land rights, fishing rights. It is said that his descendants on Fedraey now, they are the owners of some of the fishing grounds and lands on Mangeyang." “There is another story about these new sailing ships coming here. It was said that this ship had first been to Helen’s Reef in the Palau Islands. Helen’s Reef has many giant clams. So when they got to Helen’s reef, the captain found these giant clams. Well, maybe they took some of the giant clam’s meat and then the captain was thinking of the clam shells. "Now these are huge shells. He was thinking maybe he could make something out of them, if he took the shells back to, let’s say, England or somewhere. So he dumped these ships’ ballasts at Helen’s Reef and in their place, he filled up the ships’ ballast sections with these clam shells. And then he sailed to here. "When he got here, then he anchored really close to the shore. Another fight broke out, so the men here killed all the people on the ship. And that’s the first time for them to see iron, so they started looting the ship. And they took the ship apart, even the nails, they pulled them out. Location of Helen's Reef relative to Ulithi. One of the giant clam shells off Falalop in the area where this attack is said to have taken place. 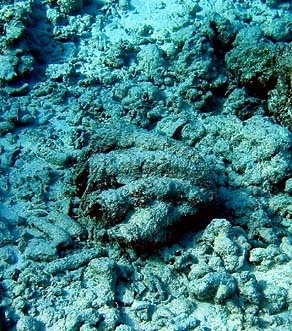 This type of clam is said not to be found in Ulithi. "And so they say that that’s how, if you swim in that area, you will see all these giant clam shells. Even today you can see all those shells. But it was believed that these natives just tore the ship apart, taking all the planks and whatever they could get a hold of, especially the metal parts, probably bronze or iron. "Even a nail was really precious to them because they could sharpen it, put it on stick and use it for a spear. And so it was said that how we got the clam shells there, those giant clam shells. "And from what I heard, some other stories, those ballast stones were found at Helen’s Reef. And the ballast replacement, which are the clams, they are found here." “A galleon that was sunk over there off Mangeyang,” Cal says, “back long ago. I believe it was either Portuguese or Spaniards’ ship that was sunk. It kind of ran aground, on the lagoon side. That ship came here inside the lagoon and for some reason, either it’s on it’s way out, because it’s close to one of the channel, then it probably ran aground there. And the remnants of that are still there, you can see the outline of it, on the reef. “I can still recall a time that there were some Filipinos who lived here on Asor," Roke Wur says, "and they bought copra from the natives and they paid for this copra. I’m not really sure under what administration, or whose administration was that. I still remember that during that time, that’s when beads were introduced to this island. The beads that people make our necklaces out of. The first introduction of these beads to this island was during that time. “It wasn’t really the money that they bought the beads with. It was sort of like an exchange: some people exchanged copra for the beads. 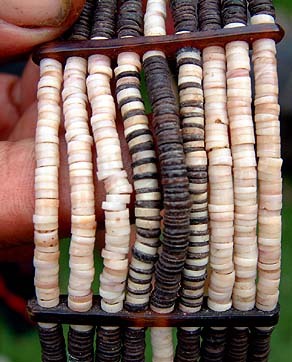 But the money that the natives were paid for their copra was mostly in coins. I don’t know what currency, but they were in coins. I was still young at that time. But I still remember that they paid in coins. There was no paper money, only what we termed ‘metal’ money. Some traditional beads. These are still worn today, especially for dances. 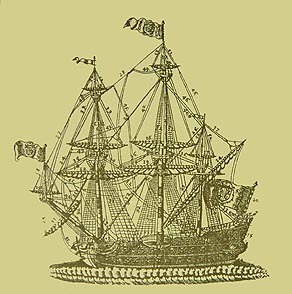 A typical Spanish Galleon/Frigate of the 1730s. She carried 50 guns. Sketch by José Gonzalez, chief pilot and Admiral of the Manila - Acapulco run, 1731 - 1734. From Lévesque (2000). “Let me explain the term reepsaech,” Mariano interjects. “When in the old days people were sailing from Ulithi to Fais, sometimes they encountered storms and they got blown off course. And they would drift all the way to the Philippines. Newcomers filtered slowly through Ulithi and the Central Caroline islands. Click here for a list of foreign ships that passed through Ulithi during this time. Among the passengers on these ships would be the first Spanish missionaries.